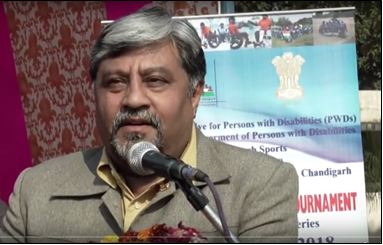 Chandigarh Management Association (CMA) participated in a three day innovative workshop on Peace and Leadership Development through Sports for young persons with disability on wheelchair, hosted by the Association of Professional Social Workers & Development Practitioners (APSWDP) in line with the objectives of United Nations Office on Sport for Development and Peace (UNOSDP). This three day workshop from 20-22 January 2018 at Chandigarh was inaugurated by H.E. Prof. Kaptan Singh Solanki, Hon’ble Governor of Haryana. The workshop focussed on leadership & capacity building of persons with disabilities and also to provide them with a platform to exchange their ideas with the sports, legal and welfare organization working with persons with disabilities. This unique workshop included i) technical sessions on disability laws, policy and programmes, ii) interactive session on National Policy for Persons with Disabilities, iii) awareness session on The Right of Persons with Disability Act, 2016, iv) sharing of Policies, Programmes and Schemes for Persons with Disabilities In India and v) lectures on Capacity Building, Developing Leadership and Skill Building among Persons with Disabilities. The workshop also included Interstate Wheelchair Cricket Tournament (League Match Series), under the aegis of emerging India Wheelchair Cricket Association (IWCA), which was participated by 40 participants from Chhattisgarh, Gujarat & Punjab.